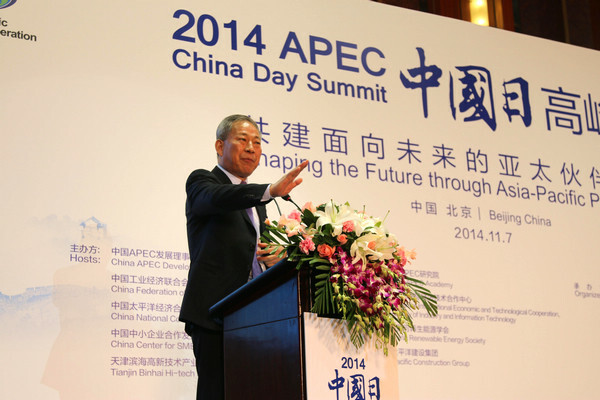 From November 7th to 8th, “2014 APEC China Day Summit” and “Emerging Industries Forum of APEC China Day 2014” were held respectively in Beijing and Tianjin. President Yan Jiehe, as invited, attended the forums and delivered speech regarding “boosting economy to a innovative development” and “the reform of innovative industries and traditional industries in the internet era”. 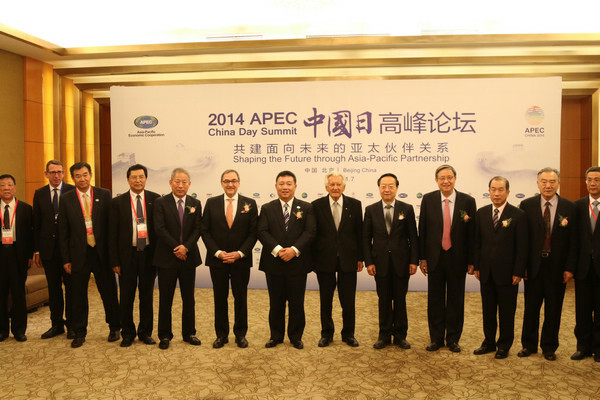 Political leaders home and abroad, leaders of technology and business field, APEC representatives, officials China embassy. 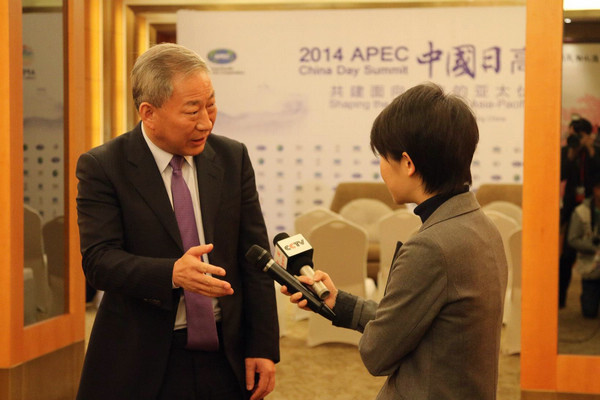 In the speech, President Yan mentioned that the imperative meaning of APEC is to open and communicate. 99% of the divergence is due to lack of communication or ineffective communication. The great difference of the economy between before and after opening-up policy showcases the importance of open economy and communication. As he proposed, we should respect the economy regulation with Chinese characteristics on the premise of being open and communication in order to complete the capital development, capital accumulation and further shoulder the social responsibility and obligation. 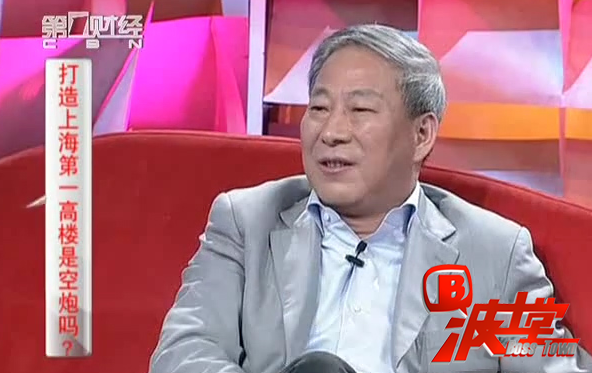 When talking about the situation of private owned enterprises, president Yan Jiehe, who is entitled as the godfather of Chinese private owned enterprises, hit the nail on the head. He pointed out that because of the pressure of high bank interest rate, the monopoly of gas, water and petroleum by central government enterprises, including the increasing labor cost day by day, small and mid-size enterprises in China could barely survive. Therefore, he called on the vast range of SMEs to be self-innovative, transforming the industrial type and appealed the central government to “streamline administration and institute decentralization” and “rule the country by law”. He also encourages those capable enterprises to “go out” and seek overseas developing opportunities. He also emphasized that the competition of countries is actually laid on the competition of enterprises while the industry one enterprise steps in is mainly the determinant of its future. The modern industry, in general, is no more than industrial economy, financial economy and consulting industry. All of these economy bodies are of great importance in the developing and innovating process of enterprises. During the forum, President Yan Jiehe received joint interview from CCTV, IFeng, People’s Net, VICN, 360 News and other media. Regarding hot issues such as anti-corruption and the New Normal, President Yan Jiehe expressed his distinct and insightful ideas, which won him many applause. It fully demonstrated that charm and courage he bears.